Football coach Andy Coen has resigned from his role after receiving a diagnosis of Early-Onset Alzheimer’s Disease, according to a Lehigh Sports release. Coen served as the Mountain Hawks’ coach for 13 seasons, starting the role in 2006. He has compiled a record of 85-64 at Lehigh and has won five Patriot League Championships. He was also named Patriot League Coach of the Year twice in his career. His most recent championship titles were in 2016 and 2017. 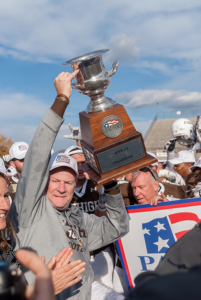 In 2017, Coen’s last championship, the Mountain Hawks recovered after a 0-5 start to go 5-1 in the Patriot League. The Mountain Hawks defeated the Lafayette Leopards 38-31 to capture the Patriot League crown. In what would be his final season as head coach, Coen’s team went 3-8 (2-4 Patriot). The team’s season ended with a 34-3 victory at Lafayette in the 154th meeting of The Rivalry.